Stratford Bike Hire Ltd is a family run cycle hire business interested in developing sustainable leisure and tourist transport in Warwickshire. Our bikes are well maintained and serviced Trek and Dawes mountain bikes and hybrid touring bicycles which are the perfect bikes for family cycling. Our hire bikes include a range of male and female sizes of mountain bikes, hybrids and touring bikes, child bicycles, trailerBikes (tag-a-longs), and infant trailers. 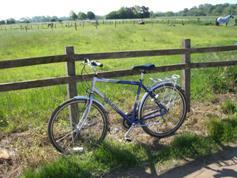 We also have a Dawes Tandem which is great fun and a Pashley Tri1- Adult Tricycle to hire. 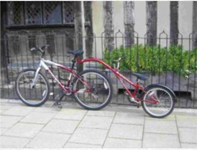 Hire a trailer bike to create a tandem its a fantastic way for young families to enjoy cycling. Riding a tagalong allows the child to help with the cycling and allowing greater distances to be travelled without worrying about tired legs. The Stratford Greenway is the perfect place for a trailer/tandem as it is flat and straight with NO traffic. The Pashley Tricycle is ideal for people who cant ride a bike. As the Greenway is flat and straight it is ideal for practicing. Call us for details of how to hire it.